This is our final lesson in this tutorial series and it’s going to be an ultimate beginner’s guide to SEO. First, we are going to install a plugin that will take care of the optimization of the entire website architecturally. Then, I will walk you through how to set up each page ready for SEO by following a basic SEO checklist. What do I mean by “ready for SEO”? It means to set up and make your website friendly to the search engines like Google. That is what people call Search Engine Optimization, known as SEO. If your goal is to run a successful business online, you must understand and master how to properly SEO your website. In this final lesson, I’ll touch the base so that you can sail out onto your SEO journey with a solid foundation. 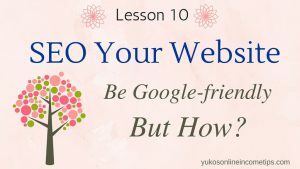 You may be wondering: Why do I need to set up my website to be Google friendly anyway? Well, you need visitors to your website, right? We did learn how to add affiliate links to your site in the previous lesson but imagine no one is visiting your site and clicking those links. What does it mean? You earn no commissions, hence no business. Google plays a HUGE role in generating visitors to your website. If you properly SEO your website, meaning setting it up in the manner that Google understands your site better, they will rank your website higher in the search results. You want to get rankings at least on the first page in order to see any traffic (visitors) for your content. Once your pages start appearing on the first page of Google, then what happens? Your website will have more chances to be exposed and discovered by online searchers. SEO > Website Rankings > More Target Traffic = Revenue (Income)! This is why online marketers make a fuss about SEO. The bottom line is, good SEO practices are crucial for your online success. You can read this post to understand what SEO is in more detail. Before we proceed with today’s lesson, here is the list of our prior lessons. First and foremost, we need to let Google know that our websites exist. We call it indexing. They first index (acknowledge) your website, periodically crawl (visit) inside of it, and properly rank (evaluate) the value and quality of the site. How can we make the search engines know about our sites and make their evaluation process easier? 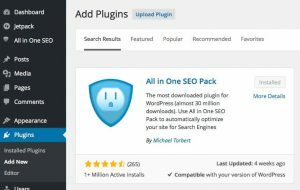 Well, there are plugins you can add to your WordPress site for free that get all of these jobs done. My recommendations are Yoast and All In One SEO. What these plugins do is to set up your websites architecturally so it’s sound in terms of SEO and friendly for search engines. It saves you tons of time and energy so let’s install one. I have used both and they equally do a wonderful job to assist you with SEO. All in One SEO was the very first SEO plugin I used when I started out and I feel it’s more newbie-friendly. 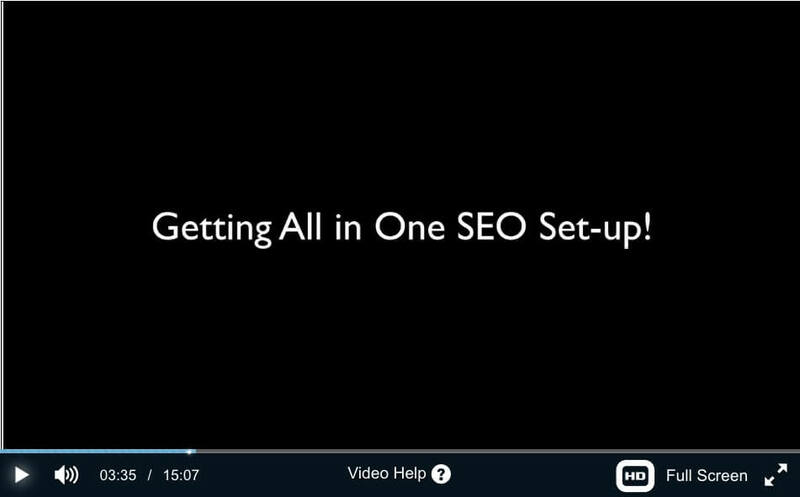 So I am going to use All in One SEO in this tutorial. Installation of any plugins is quite simple. Just follow the 5 steps below. Plugins > Add New > Type “All in One SEO” in the search bar > Click “Install Now” > Activate Plugin, and you are set. For a step-by-step instruction, watch this walk-through video. Once you have installed the plugin All in One SEO, you should see it listed right below “Dashboard” on the left sidebar. Now, hover over it and click General Settings. Here we are going to complete essential settings. Scroll down to “Home Page Settings” and we are going to manually type in the Home Title and Home Description of your website. Why is this important? Because here you can manually control how your website will be presented in Google search results. See the example of my new website PurePinkSalt.com. This is how my site is presented among other search results when they perform an online search under the keyword “pure pink salt” and I set this within All in One SEO. Next, add a brief description in Home Description elaborating what your website is all about like I did below. Keep it concise and to the point. It has to be under 160 characters. Know that you can always come back here and change these settings so try not to perfect it from the beginning. As for the Home Keywords area, what you type in here does not do much in terms of SEO so I normally leave it blank. If you want, you can add relevant keywords to your niche. Now that your Home Page Settings are taken care of, you can leave the rest as they are for now. Don’t forget to click Update Options on top or at the bottom to save the settings. Again, you can see all these procedures in more detail in the video above. Once your website is indexed (recognized), search bots from the search engines (e.g., Googlebot) regularly crawl your site to check on it. This is how they understand what your site is all about. This is also the time that they evaluate the value and quality of your site so that they can determine how high they would recommend it to their customers (online searchers). Thus, it is vital to organize your content in the manner that it’s easy for those search bots to crawl and understand its value. From now on as you write each blog post, page or article, make it a habit of going down the checklist below. These are the fundamental On-Page SEO tactics and they make your content more appealing to the search bots. Keywords in the title – If possible, place your keywords in the beginning of the title tag. Take a look at the title of this post. “Beginner’s Guide to SEO” is the keyword and I place it in front of the title tag instead of back-loaded it. If you are still having a hard time understanding what keyword is, go to this blog post. Keywords in Your Post URL – WordPress automatically assigns the title of your post to its URL, so as long as you have included keywords in the title tag, you are good to go. If your URL is not automatically taken care of, make sure to keep it SEO friendly by eliminating unnecessary stuff such as date or author name. Keywords in the First Paragraph – Preferably, within the first 100 words. Keywords in Subheading – Include your keyword at least once in an H2 or H3 subheading. External Links – Include outbound links to authority sites such as news sites, Wikipedia, or any popular blogs. Write Long Content – Some studies have shown that longer content (1500+ words) ranks higher in Google. Use Multimedia – Include images, screenshots, and videos in your content. Custom Meta Title and Meta Description – What are they? These are the title and description of your post that show up in the search result. They affect CTR (Click Through Rates) of your post so be sure to optimize it. You can do this easily if you have installed All in One SEO. At the end of each post, you will see the area where you can manually write the Meta title and Meta description. I hope this lesson was helpful for you to understand what SEO is and the basics of how to do SEO your website. There are many more factors that would contribute to your SEO, which I will discuss in separate blog posts, but as a beginner just follow this essential checkpoint, and you will be okay. SEO was a very confusing term when I first started out in the online world. As you develop your website, however, it will start making more sense to you, so try not to overwhelm yourself in the beginning. Take one step at a time. This is the end of this tutorial series, Online Income 101. You now have a website on a steady hosting site, up and running, with good content with affiliate links added, and properly set up for SEO. Congratulations on your accomplishment! Your online income journey has just begun and there are a lot more things to implement to your business. I will keep sharing tips and techniques that would help your website and business grow. I’ll continue to share the progress of my new website, PurePinkSalt.com as well. Keep adding great content. Remember, the key to success is to have trust from your audience. Your website and you must become something trustworthy for visitors to click through your affiliate links. Create each content with the intention to help, not to sell, and become a great resource for your visitors. Income is a byproduct of how helpful your website is to people. Affiliate marketing is an opportunity to earn online income that is equally provided to anybody who is committed to working hard. To be successful, these things are essential. Thank you so much for joining me in this Online Income 101 course. I truly hope that this series helped you to start out with your online business. I am still learning myself and looking forward to achieving great success together with you. Do drop me comments or questions below and let me know if there is anything I can help you with your online journey. 2 Comments on "Beginner’s Guide to SEO – How Do I SEO My Website?" Great article and important stuff for new web designers to learn. I found this article very interesting and easy to read and follow. We are currently just building a website and have just went through this process. We will keep your site bookmarked to see what other helpful information you may have that we may find helpful. I am glad this article helped you with your website development. Building your website SEO friendly is fundamental for your online success. The notion and tasks may seem confusing in the beginning but as you practice it starts making sense and you’ll be SEO expert in no time. Let me know if there is anything I can assist you with.